Must meet all Federal Motor Carrier guidelines. 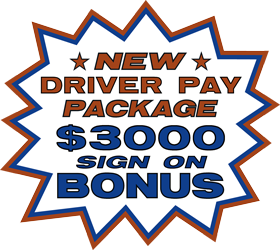 Must have a valid Commercial Driver License with proper endorsements, in the state of residence. No current license suspensions or revocations. Excessive speeding, involving any single offense for any speed of 15 m.p.h. or more above the posted speed limit. Reckless driving, as defined by state or local law or regulation, including but not limited to, the offense of driving a motor vehicle in willful or wanton disregard for the safety of persons or property. Driving while intoxicated or under the influence of drugs/alcohol. A minimum of two (2) year experience in the operation of tractor/trailer equipment. Must be a minimum of 23 years old.